First of all, the main goal of the Michael Shanks Racing Team was to hit Daytona International Speedway to break Bill Elliot’s qualifying lap record set during Speedweeks for the 1987 Daytona 500. Awesome Bill from Dawsonville set the record back in 1987 with a flying lap speed of 210.364 miles per hour with his Coors sponsored Ford Thunderbird NASCAR stock car and even though an endless stream of the world’s fastest racecars have hit the Daytona high banks since then, none of them have turned in a quicker lap time – until now. Driven by 25 year old Colin Braun, the Michael Shanks Racing Daytona Prototype racecar powered by the 3.5L EcoBoost racing engine turned in an average lap speed of 222.971 miles per hour. This shattered the previous record by over 12.5 miles per hour but the MSR team took more than one try to set this blazing fast record. The Michael Shanks Racing car used to set the new Daytona lap speed record relied on a chassis setup designed by Riley Technologies and a 3.5L Ford EcoBoost twin turbocharged V6 built by Roush Yates Racing Engines. Finally, Continental Tires offered up a special set of tires with a lower rolling resistance and a harder rubber compound than what is used on a normal road racer like the MSR Daytona Prototype. Finally, not only did Colin Braun and the MSR Ford EcoBoost powered Daytona Prototype racecar set the record for the fastest flying lap at Daytona but Braun was also able to set two world records that have stood for decades. 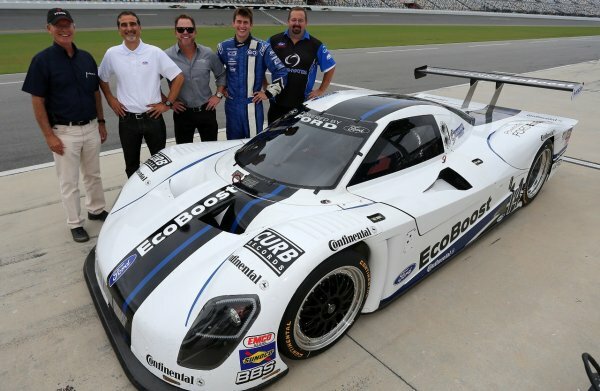 The EcoBoost’d MSR endurance racer set a new record for the fastest average speed over the course of 10 miles of 210.018 miles per hour and the fastest average speed over the course of 10 kilometers of 202.438 miles per hour. The new Riley Technologies Daytona Prototype race car and the new EcoBoost twin turbocharged V6 race engine will both make their formal racing debut in January at the Rolex 24 – which is also held at Daytona International Speedway.